We have been on a whirlwind of adventure over the last 6 months, full of confetti cannons, spray shows, sharing platters, strawberry daiquiris and MK’s 17. We have so many stories to tell (however we know how precious time is ) so we have listed some of our highlights created by both staff and customers. So, in no particular order, please see the best of 2018! 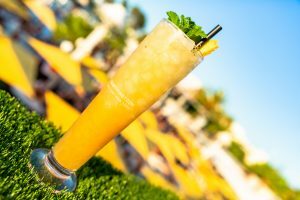 This was a tough one – the O Beach Ibiza menu is full of fresh, good quality produce that leaves your mouth watering with excitement. There were a number of top picks including the Teriyaki Salmon couscous dish and the American Black Angus steak. 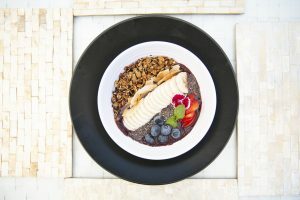 However there can only be one winner and this had to be the Acai Bowl .This bowl of goodness includes, fresh blueberries, dry roasted coconut, acai pulp with amazonian guarana, strawberries, granola toasted with honey, bananas, edible flowers, and not to forget our chef’s secret ingredient, which despite us pleading, he will not reveal! He says this secret ingredient is what makes it the best on the island. If you would like to recreate this gem at home, please follow the link to enjoy the full recipe. There have been a number of spectacular costumes throughout the season, so we thought the best way to decide was to put a poll out to our followers and ask you all what you think. I can now can reveal the costume that was ranked number one, is our fruity pineapple costume from Wednesday’s Hotbed party. This costume was inspired by Carmen Miranda and consists of a bespoke pineapple turban, sequin shorts and a custom made yellow satin off-the-shoulder tie up top. This is all topped off with fabulously fruity props and hair and makeup by Kiss My Fairy. The most ordered drink hands down has to be the Strawberry Daiquiri – not a day went by where you wouldn’t see our amazing bar staff passionately preparing jugs and glasses all day long. We wanted to add another winner to the mix (as voted by the staff) this is the Zacapa Mule. The staff’s choice is a combination of ginger, pepper, Zacapa rum, cognac liqueur, pear, lemon and ginger beer, paired with a summers day it can’t get much better than that. If you would like to know how to make our favourite drink, please see this video for the full recipe. We love telling a story at O Beach Ibiza and one way we do this is through our productions. We like to take our clients on a journey, bringing them together through spectacular moments created by jaw-dropping shows. We have seen it all, including Lorena De Tena being craned in on her bright pink piano with a huge love heart sweetie packet above her, the Kisstory rocket complete with smoke and choreographed dance shows, we have a mirror balled bananah with floating pineapple and not forgetting our beautiful princess perched above her crown, realising the kissing frogs all equipped with amazing giveaways. We can’t believe how much we’ve crammed into one summer ….. And the winner of the most instagrammed show is our fabulously furocious Queen Kong. With her bubble gum pink fur coat and ice cold roar, it is no wonder her presence left onlookers amazed. 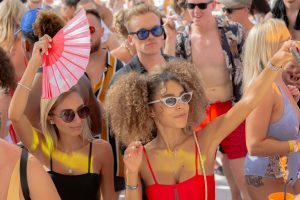 There were so many elements to this show including Sergeant Sassy whipping the ISIF army girls into shape, If you didn’t manage to experience it this year then you can find out more by clicking the link below and reading our blog, making of pool party. everything from florals, stripes and animal print, it has been a very colourful year and we can’t wait to see what next year will bring. 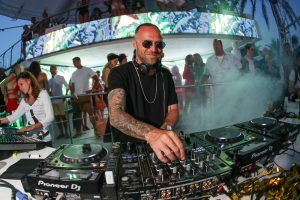 For all of you that have been to O Beach Ibiza, I am sure you would of witnessed some of our fun and exciting drink shows. We have a number of exclusive packages to choose from ranging from our famous unicron to Cleopatra sat upon her chaise lounge. However after speaking to our internal host team, it’s clear the most popular one for 2018 is, the Boat Show. This package starts poolside with it’s captain and sailors marching through the venue with whistles and smiles and ends up in the pool as our internal hosts deliver drinks dressed as captains and sailors to the beds. It is safe to say individually we all have our own track of the summer that takes us back to a moment we was dancing in the sun with our best friends, however It only made sense that we took this question to our resident DJs so let’s see what they all had to say…. DJ Loeca-Weiss- Feel my needs.